The relocation of the collections of the Netherlands Institute of Southeast Asian and Caribbean Studies (KITLV), from the Reuvensplaats to the closed stacks at the University Library is in full swing. This will last until February 1st. In total, 12 kilometers of collections will be moved. During the relocation supply of requested materials may be delayed, but we aim to supply once an hour. The stacks at the Reuvensplaats still contain some personal collections of researchers (archives, materials, documentation files etc.). 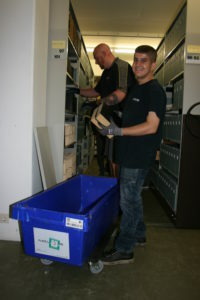 The KITLV reference library at the University Library has been moved from the open stacks on floor -1 to the Noordhal’s ground floor. This measure was taken to create space for the East Asian Library collections that are being brought in from the Arsenaal. The KITLV reference library will also be shelved according to the Library of Congress Classification. On March 1st 2017 the collections will be relocated to the Asian Library, along with the reference collections for China, Japan and South and Central Asia.